Provide comfort for the family of Betty Stockdill with a meaningful gesture of sympathy. To plant a memorial tree in honor of Betty Louise Stockdill, please visit our Heartfelt Sympathies Store. 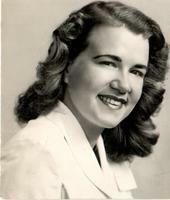 Betty Stockdale was an icon of her times. Her ability to teach was surpassed by none. She had a pleasant aura that cast a memory few could forget. Her 'paddle' was feared by many but she was loved even more. Rest in peace dear Betty, : Until we meet again. Betty was a truly beautiful person in so many ways. She helped me so much in my first years as a teacher. She was a wonderful friend and mentor. My parents were skating friends from the 1940’s, My Art Club enjoyed her company on many a trip and dance at the High School. Betty’s wonderful stories will live on in the memories of her former students and friends. She will be greatly missed.